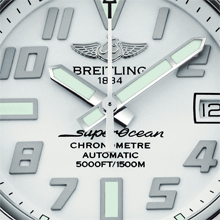 The Breitling spirit is set to make waves again with a new version of the Superocean 42 entirely clad in white from strap through bezel to dial. 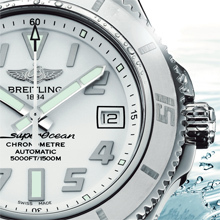 Ultrasturdy, ultra-sporty and water-resistant to the fabulous depth of 1,500 meters (5,000 ft), this diver’s watch with a steely character has already established itself as a champion of reliability on the wrists of those with a taste for powerful sensations. 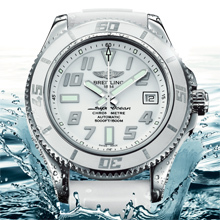 In its new White Water version, it will appeal to women who enjoy mixing style and performance, boldness and excellence. Available exclusively from Breitling boutiques, this special series with its fresh and original look is equipped with a selfwinding movement chronometer-certified by the COSC (Swiss Official Chronometer Testing Institute). The white rubber-molded unidirectional rotating bezel and the distinctive dial are adorned with dynamically styled numerals. The thick sapphire crystal is glareproofed on both sides. The powerful lateral reinforcements protect the screw-locked crown, while a safety valve serves to balance out differences in pressure inside and outside the case. An ideal instrument with which to cross any waters with the utmost confidence, and to sail through fashions with inimitable elegance. Movement: Breitling Caliber 17, officially chronometer-certified by the COSC, selfwinding, high-frequency (28,800 vibrations per hour), 25 jewels. Calendar. Case: steel. Water-resistant to 1,500 m (5,000 ft/150 bars). Screw-locked crown. Unidirectional ratcheted bezel. Cambered sapphire crystal, glareproofed on both sides. Diameter: 42 mm. Dial: white.